Senyaka - Bayanyonyoba. Vinyl 12. Bleep. Killer deep house from South Africa courtesy of the Rush Hour crew here, one that’s bound to appear in countless festival sets this summer. 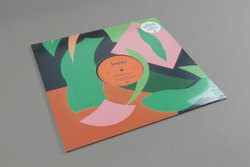 Coming out of the kwaito and bubblegum era, Senyaka delivered a unique kind of trippy, psychedelic sound that is best encapsulated on the A side of this 12”. On the B side we have a left-field leaning soul/funk crossover with the typical kwaito percussion that just makes us want to move straight away. Antal and co have been doing a stellar job with the Rush Hour issues of late – full support from us here at Bleep!